Wind Lane is the second oldest child of Vincent and Amanda Lane, with his age in "Lane Miserables" given as "30ish" by Glenn Eichler. His siblings are Summer, Penny, Trent and Jane. Like his siblings, Wind would have attended Lawndale High - his sister Summer would have been a student as well, during Wind's first year or two. If he was 31 in his first appearance, he would have been a freshman when Kevin's mother and father (both 35) were seniors. 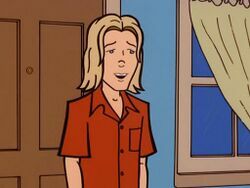 In the Daria series, Wind makes speaking appearances in "Lane Miserables" and "Art Burn"; he is first mentioned in "The Teachings of Don Jake", and a postcard from him is in "The Daria Diaries". Wind is portrayed as a neurotic and narcissistic man, incapable of maintaining a close relationship for long. He is first mentioned as intending to marry again "if he can just figure out whether his divorces were legal"; his postcard home in "The Daria Diaries" reveals this was to a woman called Sheila and was done at the Hitch Hutch ("Where 'I Do' is Drive Thru!") rather than a church. He believes the marriage is okay legally as "the guy who married me last time was not who he said he was", and that Sheila "isn't like the other ones". By the time of "Lane Miserables", less than a year later, it was revealed that he's married now to a Katey and they live on a houseboat; he used to be married to a Claudia, and has two alimony payments to cover. In "Miserables", he was separated from his wife Katey and upset that he'll "never learn how to love", obsessively pouring over guides to saving marriages and bursting into tears. Wind and Katey eventually manage to come back together... only to separate again in "Art Burn". It is unknown what his current relationship status by the end of the series is. Besides (or perhaps in tune with) his neurotic part, he is shown to be whiny and prone to return to the Lane family home in Lawndale with every personal upset. He is happy to see Penny Lane is okay after a volcanic eruption, but she treats him disdainfully (as she seems to do to everybody). Later, however, she seems to try to comfort him during one of his crying fits, only to get him angry by apparently insulting Katey. It is further revealed that, while a child, Wind had wanted to change his name to Ronald. His parents were horrified by the idea and quickly made up a story that when he was born they had taken him to the "naming gazebo" to name him. He mistakenly views the gazebo as a key part of his childhood and was distraught when it was destroyed. "Leaves of Loss: Wind Lane's Used Self-Help Book Nook"
"A collection of gently-read and perceptively underlined pop psychology paperbacks for sale at half the list price. (Need the money for alimony payments.) These books have helped me to gain greater insight into my motivations and shortcomings so that I am now a more complete person able to love -- and just as important, able to be loved -- selflessly and fully. If I ever get the chance. "P.S. : If you're reading this, Katey, I swear I've changed." When Wind Lane appears in fanfiction, it's usually in his canon role as an emotionally unstable mess, incapable of forming longterm relationships and randomly crying about it as a result. "The Towel Boy & the QB Find Love" by Shiva in which Wind tells Kevin Thompson about his time as a towel boy for the Lawndale Lions and how he first found love with Kevin's dad, Doug Thompson. This page was last edited on 9 March 2014, at 15:43.